According to the National Retail Federation, we'll spend $68.8 billion outfitting our students for school this year. Yes, I said $68.8 billion. Sounds like a lot of money, right? Good ideas all, but I'd add another tactic: Start early. Ideally, you've already begun. No? Then start looking now if you really want to save money. Don't wait until two days before Labor Day and then go the one-stop-shopping route. The OSS retailers get you through the doors with a few loss-leader prices and make their money back on everything else. The NRF notes that families with kids in elementary and secondary school spend an average of $603, and parents of college students fork over about $808. This includes clothing and electronics as well as notebook paper. Maybe. But it's also possible that some parents buy new because, well, it's a new year. To which I say: Are you out of your mind? Why are you instilling the relentless need for new Stuff when the old Stuff might work just as well? Have your kid to go through dresser, closet and desk. Send her spelunking under the bed for stray markers. 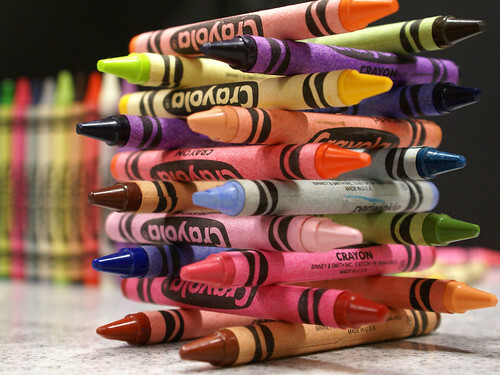 Make a pile of crayons, spiral-bound notebooks and other stray educational tools. Inspect the three-ring binder for cracks. Test the backpack straps and make sure the zippers still work. A kid might have to bring everything from dry-erase markers to a personal box of tissues. Just for gits and shiggles I checked one of these lists. Elementary-aged kids need, at minimum: a backpack, gym shoes, tissues, lunch bag, pencils, crayons, white glue, markers, erasers, scissors, pocket folders, binder, notebook paper, dividers, composition book, colored pens and a ruler. Warning! The following statement makes me sound really old. In my day, we brought a three-ring binder, notebook paper and pencils. If we couldn't afford paper pr pencils the school provided them. Crayons and scissors were doled out as needed for projects. Only the teacher had markers. Dinosaurs picked us up and delivered us back home. Times have changed, so watch the office-supply stores (Staples, Office Depot, Office Max) for impossibly cheap school-supply sales. This morning I saw packages of pencils and index cards for one cent each. Buy the maximum amount allowed and you may get enough to last most (or all) of the school year. Hit those sales as early as possible each week, because other parents have the same idea. Loss leaders may be sold within hours of the opening bell. If the ad doesn't specifically prohibit rain checks, ask for one. Note: Your third-grader may plead for a new lunch kit on the grounds that the other kids will laugh when he takes his PBJ out of a “Batman” lunchbox. He might be right. In our increasingly media-driven universe, it's mortifying to eat from a pail emblazoned with the wrong superhero. You might not mind buying a new lunchbox every time the fads change. But maybe you're wondering how you're going to pay for everything on that list and still keep the lights on. Or maybe you have an aversion to replacing items that are still perfectly usable. If so, then float a compromise: If you give in on the lunchbox, he's not getting a new backpack. (Nor should he, if the old one is in good shape.) Get one of those insulated lunch kits, which tend to be more generic in appearance, rather than a box with a cartoon character on it. Tip: Put a note on your June 2012 calendar to inventory what your kid lost or “forgot” to bring home, then visit the school's lost-and-found. The L&F box at my daughter's elementary school looked like a department store. How in the heck don't parents notice that their kids' lunch boxes, backpacks, notebooks or winter coats (!) didn't make it home one day? Look around your house for pencils and pens. Hint: The only place they aren't is…right by the phone. Whenever you're in a place that gives away writing implements, take one and say thank you. If your fourth-grader is embarrassed to be seen with a credit-union pen, keep them around for doing homework and save the Bics and Dixon Ticonderogas for school. If last year's spiral-bound notebooks were only partly used up, tear out the old pages and start afresh. Don't give pencil sharpeners to kindergarteners or first-graders. They get a little carried away. Hand sanitizer really is required in many schools. Small bottles of the stuff will likely go on sale at drugstores and office-supply emporia. Here's the rule: Junior keeps it in his backpack, not his desk at school, so you can refill as necessary from the jumbo bottle you got at Costco. Start looking now for discounted gift cards to pay for these things as well as for any clothing (more on that below). Truly desperate? Talk to the school nurse or principal about doing a little “shopping” in the lost-and-found. At my daughter's school, unclaimed goods were given to kids whose parents couldn't afford certain items. New, or new to you? Who came up with the idea of the back-to-school wardrobe? The people who sell the wardrobes, that's who. Before you re-kit your kid, think about whether it's really necessary. Understand: I am not advocating that your child go to school in shoes that pinch or jeans that show her ankles. What I am saying is that there's no need to re-do a wardrobe if her clothes still fit and are reasonably presentable. Having just-said it, allow me to suggest some ways to find lower prices on new clothes. For starters, who says it has to be new? Consignment stores, thrift shops, and garage sales are all potential clothing sources. My niece uses all three sources and pays pennies on the dollar for name-brand clothing. Clothing swaps are another possibility. Organize them through sports teams, parent groups or your place of worship. Online swap sites like ThredUp might be just the ticket. Don't forget The Freecycle Network, either — I see kids' clothing on there all the time. Some parents even post pictures. Tip: If used clothes bug you, wash them. Problem solved. Tip: Live in a warm climate? Lucky dog. Just stock up on remaindered summer garb for the rest of the year. Online stores have clearance sales, too. This is easier to do for younger kids and/or kids who fit in basic sizes, and who don't care if you pick out their clothes. Be sure to look for online coupons and free-shipping codes through sites like Retail Me Not and Savings.com. Don't enjoy tracking bargains? Enlist the help of a price-comparison website such as Pricegrabber, FatWallet, and FindersCheapers. Tell these sites what you want and let them do the hunting and gathering. You might even be able to set a deal alert and receive an e-mail when those Levis go on sale, or a refund alert if something you already bought went on sale. Tip: Use cash-back shopping sites to make discounts even sweeter. It's not that I don't think you should spend anything on your kids come September. On the contrary: I believe that there's nothing like that new-crayon smell. A couple of symbolic purchases can help your child get excited about a new school year. Kidding! Few children are truly excited about the day after Labor Day. (Full disclosure: I was. Then again, I got called “teacher's pet” a lot.) It's fun to see their friends again, but getting back into the educational harness is always a period of adjustment. Seeing that Junior has all the necessary tools can help re-orient him back into that universe. Bring him into the equation by asking him to look through the Staples or Office Max flyers with you and compare what's on sale to the list of necessary supplies. Suggest that money saved by sale prices and judicious re-use of last year's stuff could defray the cost of a coveted item. You know, like those shoes that are $20 more than you want to pay. A special purchase might add a bit of frisson and make the transition somewhat easier. You'd also be modeling my personal mantra: Save where you can so you can spend where you want. Finally: Some cultures start the school year with candy or other treats, to emphasize the sweetness of knowledge. Consider instituting this tradition in your own household by serving a smoothie loaded with berries or slices of mango and pineapple on the first day of school. Avoid doughnuts or Froot Loops, though. They may lead to running with scissors. School supplies photo by Steven Depolo. Crayon photo by Chris Metcalf. Photo of the bouquet of pencils (which J.D. loves) by Melissa Doroquez. There are 115 reader responses to "Frugal Back-to-School Shopping". 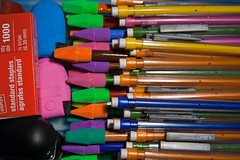 Besides clothing, you can find other great school supplies used at thrift stores. I’ve seen three ring binders, blank agendas, backpacks, lunch boxes, thermoses, laptop cases, etc. It never hurts to look in the households section when you’re shopping for clothes and shoes. I live in an area where school will begin next week. I use the supply list that was mailed out with the report cards to shop throughout the summer, slowly building up what’s needed. We use a hybrid of both new and old to begin the school term. I take advantage of the warm weather sales and purchase a few new things to combine with what already fits. Sometimes, backpacks are purchased, some years we recycle them. The key is to not get sucked into the advertising frenzy and just stick to good ole common sense. Very regional. It has to do with farming- believe it or not. It seems to be settling into 1 Aug to 1 Sept routine. One of my friends lives in a Northern state and gets the entire month of January off because of the snow! Doesn’t it have something to do with climate, too? When I lived in Texas, we started school very early in August (because it was too hot to be outside) and got out in early May (before it was too hot to be outside). But it’s definitely regional. I went to schools in four states – up north we started after Labor Day. In the South, kids start going back next week. Here in the northeast school traditionally starts around Labor Day with weeks off in Dec, Feb and Apr. We have to do 180 days of schools which means we let out end of June (depending on # of snow days). Speaking of which – does anyone watch Phineas and Ferb? How on earth do they calculate 104 days of summer vacation?? It’s more like 70 around here. Unfortunately, our early start (Aug 22) in in prep for standardized tests – March of next year! More teaching time before the tests. Some school systems were pushing the start dates to early Aug and the FL legisature passed a mandate that the public school year could NOT more than 2 weeks before Labor Day so that is what we do. Hrrrm…so if the early start is for standardized tests, do southern schools score better on standardized tests, I wonder? (If what some people are saying about how its too hot up north (without AC) to start earlier). Also, at least in Massachusetts, the public schools, charter schools, and some of the parochial schools aren’t air-conditioned. July & August are the hottest months, so it’s better to start in September and go through June (the rest of the time off comes 1 week in December, 1 in February, 1 in April, and miscellaneous snow days). Here in WI, the state mandates that school cannot start earlier than Sept 1. Helps tourism and the employers that depend on school-aged employees during the summer months. My parents never bought me new clothes for school. Thrift store or my existing clothes were good enough. My dad also ripped the used pages out of my spiral notebook and told me to just use the empty ones. I refused since it was pretty beaten up and I was in middle school where kids can be harsh. So instead he had a sack of note books to sit by the phone to take notes with. It amazes me how much money parents spend every year on back to school supplies. It is almost as if going back to school was a second Christmas. Parents tend to feel like we have to spend a certain amount of money to provide our children with the specified amount of supplies, when in reality, they can get by just fine with MUCH less. It does not reinforce a very frugal and money smart position to blow money on school supplies every year. Conscious spending applies to this as well! I think the statistics must take into account that many people use the back-to-school sales to buy their children warm clothing in their after-summer sizes. As a parent, I was surprised by how quickly kids outgrow clothes. When it’s time for my kids to buy on jeans and long-sleeved tops for the first time after summer is over, they are an inch too short. The same with shoes (since during the summer, my kids wear sandals and flip flops). NOW I understand why my mom complained that she always felt she had to buy us clothes all the time. I wish the statistics had broken that monetary number down to a per child amount, instead of using a per family figure. I can see that amount of money easily being spent for families with 3 kids or more, considering supplies and clothing for the next size up. It would be a surprising figure for a single child. Isn’t one of the reasons that some people stock up is because back to school time is a clothes tax holiday? I seem to remember that in Texas a few years ago when I was visiting in early August. a few thoughts: LL Bean bookbags are great and come with a lifetime guarantee. Consider buying this quality item for $30(+) once instead of buying a cheaper alternative that needs to be replaced yearly. I usually buy supplies very early, but was just told that the school system is culling it’s list. They will no longer consider tissues, disinfectant wipes, a “school supply” and non instructional aids will not be on the supply list. Yes, there are long lists to come to school…but remember that the teachers spend sooo much out of pocket for school supplies. We have to have tissues and hand sanitizer and pens and markers and when they’re not there, we buy them ourselves. We don’t make much money, and what we do make is always under threat of cut. There isn’t money from the schools to buy supplies. For a free education, asking parents to contribute supplies isn’t too much to ask. When we were kids (or at least when I was, in the ’70s) school districts had funds for things like art supplies, kleenex, hand soap, and paper napkins for kindergarten snack time. Not anymore. Our school puts out the extensive list of supplies AND has a “want” list of basic supplies like “food for the hamster” and “paper towels” in each classroom. The state decided to not pay 40% of the public school budget until some unspecified time in the future, to “solve” oru budget deficit – I bet this year they’ll be asking for toilet paper and lightbulbs from parents. The lists are amazing this year. I have to supply each of my 3 kids with more supplies than I have in my own desk. Plus, I have to send in paper towels, Clorox wipes, tissues, and a host of other things. And we need 3 folders to go back and forth to school-one for homework, one for tests, and one for school papers. Really?? We can’t just use one folder for that? The amount of supplies required is off the charts. Add that to the number of books I had to buy for reading assignments and I get really frustrated. Don’t they realize that if money is tight for the school it’s tight for the parents also?! For my soon to be 1st grader, I had to get 4 boxes of 24 count pencils. Fortunately, I started early and caught them on sale for .97, but I am trying to fathom what my kid is going to do with 96 pencils in one year, particularly when every kid in the class is bringing that much. We also had to supply 24 glue sticks. We’ll take all this stuff and it will get put into a communal supply closet and any extras will not be sent home at the end of the year. I have already spent $30 just on the supplies and still haven’t gotten the 3 boxes of tissues, 2 bottles each of hand sanitizer and soap, & the 6 boxes of zip top bags in various sizes. I looked at the list of a friend, same county, different school and her list was much, much smaller. I learned my lesson last year and this year started watching the sales early. I’m going to take the tip of a previous poster and stock up during the clearance season – that was a good reminder! Please define your acronyms before you use them. NRF? OSS? Blame the media for this one. It gets blamed for everything else. If things are tight and you did not make it to the super sales, make sure your child has at least one of every thing on the list. They need 1 pencil, 1 pen, 1 small set of paper, an old set of spiral notebooks, 1 small set of paper, 1 set of crayons (old and in rubber band are fine), 1 box of kleenex, etc. Let your child know that you will get things as time allows. Your child will be prepared for school and you can wait the two weeks until everything on the list goes on half price sale. Teachers much prefer that then your child showing up with nothing. As a teacher I often went out an bought things three weeks after school started to have a supply- at 75-90% off. This is great advice! In addition to this, when you wait to buy supplies, you get a chance to meet the teacher and ask him/her if the school supplies list is accurate. It’s often provided by the school or the district, and your child’s teacher has a different (usually smaller) list of supplies needed. I used to work in a elementary school and it was amazing the amount of supplies that were left at the end of the year. On the school supply lists, there were multiple requests for 2 boxes of crayons, two packets of construction paper, 2 boxes of tissues, etc… Most of the time you were told not to put your child’s name on the supplies because they went into the teachers supply closet and were doled out as needed. This meant that irresponsible children who would not take care of their supplies and would “lose” them got the bulk of the supplies handed out. These would be the kids who in high school would be still needing a pencil or pen for class and bothering their classmates to borrow one that was never returned at the end of class (my daughter used to buy supplies on sale during the summer and resell them to classmates in high school when they would ask to borrow). I would buy what was on the supply list but only send one of each item to the school, keeping the extras at home. If questioned by the teacher I would tell her that I had a very tight budget and to send me a note when my child ran out. It rarely happened that I was asked to send in more supplies during the year. If my child came home with a note, I questioned my child about how and when the item was used up and it enabled me to monitor if my child was being irresponsible. I was able to use the “extra” supplies at home for homework and every year my expenses went down and my time shopping decreased because I already had the supplies at home in storage. I also went through supplies brought home at the end of the year to see what could be re-used the following year. Good point, Daria. My 3rd grader’s class list includes a 12-pack of red pens. What do kids that age need so many red pens for? I’m okay with buying red pens for the teacher’s use if that helps with class, but does the teacher really need 250 over the course of the school year? My son’s teacher requested 10 boxes of pencils this year. So if each box has a dozen pencils (some have 20), that is 120 pencils. Really?! You mean my kid is going to go thru 3 pencils every week. I don’t think so. Multiply that by the 20 kids in class and you have 2,400 pencils. Cost aside, what a waste of trees that is. They probably have one of those “reduce, reuse, recycle” posters up in the classroom, and then throw out all of the half-used crayons and pencils. I saw the state of supplies at the end of our last school year – everything was used up. I doubt they throw any of it away. I donated glue sticks for the last week of school because all 28 kids were trying to finish projects with about 3 mostly-gone glue sticks. In our district the request for multiple items is because half the class won’t bring what they’re asked. So it’s just like health care bills: those that pay, pay for themselves and another. We’re done shopping. I love back to school sales. And if some other kid needs that unlabeled 20 cent package of 24 crayons more than mine does, I do not begrudge them of it. Nicole: Well said! In fact, I’d go one further: If you can afford it (especially if you luck into 1-cent pencil sales), take extras and give them to the teacher so that no child will go without. There’s a reason my sister and I take grocery-bags full of supplies to the social service agency: Because the folks who use its food bank certainly can’t afford to buy notebook paper. We have year round schools here so school supply sales start in early July (3/4 of year round students start back right after 4th of July). I have been stocking up for weeks now because my kids have actually recently changed schools and are back on a traditional calendar where they start at the end of August. I buy extras of the really cheap stuff (penny deals on things like paper, pens etc.) because if they don’t ultimately need it at school during the year then we will use it at home OR be that much ahead next year. Whatever I can’t buy on super discount over the next few weeks I will head to wal-mart to fill in. Oh…and Backpacks/lunchboxes…I bought my son his backpack and lunchbox from LL Bean when he started Kindergarten. He is going into 4th grade now and is still using the same ones. Then handle on his lunch box actually ripped off in 1st grade but LL Bean replaced it at no charge. My MIL actually found a backpack in an LL Bean outlet that someone had returned that had the correct initials monogrammed on it and gave it to her for her birthday this year (she turned 5). I bought her lunch box at LL Bean with a $15 gift card I had received at Christmas time as a bonus for buying my FIL’s christmas present there. She was very excited to pick out her Kindergarten lunch box online back in February (the gift card expired in Feb. sometime). My sister told me a story about her college roommate. She had an LL Bean backpack that she had had since some time in elementary school. It finally broke a strap in college. She called LL Bean and they replaced it for her for free. Some things are really worth paying a little bit more for (and they are still quite reasonably priced, I think). As a middle school library assistant whose desk has the best-functioning pencil sharpener in the whole school, I must say that “you get what you pay for” applies to pencils. The store brand or super-cheap ones have leads that tend to break or the graphite will be maddeningly off-center. I am a Dixon-Ticonderoga or General’s fan for these reasons. I struggle with the style vs. cost issue. In our family, the rule is that the kids can get a new backpack only when they move up to a new school. (In our town, that is every 3 years.) It’s been a compromise that works, and it helps me convince my kids to consider durability. Two years ago my favorite jeans ripped, and the kids & I did a sewing project, making the legs of my jeans into custom lunch bags. Thrifting for clothes is a really effective way to build a wardrobe – particularly if you live in a mid-to-large size city. We live in a very large city, and just a hop, skip, and a jump away from us is a rather affluent neighborhood – with a number of thrift and consignment shops. I’ve found barely-worn Gap dresses for $6, and my BF regularly finds great Brooks Brothers button down shirts – again for $6! Non-name brand stuff goes for even cheaper. Ditto. I did a video for MSN Money about finding deals at thrift stores and found three or four things in a row that still had the department-store tags. Nice things. I went to the Salvation Army 50%-off sale on Saturday and bought three blouses, a pair of shorts and a soft blue zip-up hoodie for $11.06 with tax. And my purchases were on the higher end of the price tag; I saw other items that would have cost 50 cents. There were a couple of folks in there whose carts were piled high with children’s clothes; either they were stocking up or they were selling on eBay. I think there is a happy medium to be had. I remember when it was time for back to school shopping, I didn’t care if I used last year’s protractor or my brother’s old-but-unused red binder. But it was REALLY embarrassing to go to school with half used colored pencils and a random assortment of pencils rubber banded together. We always won that battle … but now as an adult, I can definitely see where my parents were coming from! Mostly, it was a compromise — we got the “must haves” but the “Are you really going to use this?” supplies weren’t purchased until we actually needed them. Great point here, Monica. 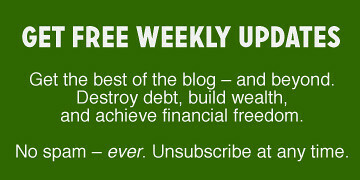 I read this article with interest, though I will say it made me glad that I don’t actually have children, because I remember all too well how embarrassed I was as a child about things that were far less frugal than the suggestions here. I’d be far too sensitive to those feelings to send my children to school with obviously used colored pencils, crayons, folders, spiral notebooks, etc. On the one hand, children are going to be teased no matter what you do, and growing the backbone to deal with it is just one of life’s many lessons. On the other hand, one of the things that truly led to my love of school and education was the excitement of shopping for new supplies and choosing new notebooks, folders, clothes, colored pencils, and the like. If spending $50 on a new stock of art supplies (while donating last year’s used stock to the school, Goodwill, or the like) was the difference between my children looking forward to the start of school and engaging in the educational experience vs. dreading every moment, then I’d consider it a sound investment. My husband’s primary back-to-school memories involve bringing a baggie of used crayons to grade school every year. I don’t think it scarred him for life, but I question whether saving 50 cents or so (late 70s/early 80s) was worth the blow to a young kid’s self-esteem on a day that is nerve-wracking for nearly all children. Again: I’m NOT saying that you can’t have new crayons! I’m saying that you need to pick your spots, hit the sales, etc. I didn’t mean to nitpick about crayons in particular. : ) Of course it’s a matter of shopping wisely. My husband’s dad had been unemployed, and his mom likely felt she was doing the most prudent thing by reusing some supplies. But kids in poor families can feel the small pinches more acutely than the large ones. I think Ellen’s crayon example was just anecdotal discussion. The “shame items” are going to be different for every child, every level of education, etc. The important point is finding the happy medium, especially when the true savings might only be one or two dollars here or there, but overall the difference between making a child’s education seem fun and rewarding or making it a burdensome display of parental frugality disguised as poverty that, as we’re seeing in the comments, yes, those children will carry with them for a lifetime. We all know that there are penny pinchers out there who, priding themselves on their all-or-nothing frugality, *would* skimp on the meaningful items and experiences, not meaning any ill will or harm to their kids, but just not seeing the importance of that new pack of crayons, the character pencils, or the new three-ring binder when compared to the security of being debt-free. But one of the pieces of financial advice that has stuck with me is the demonstration of people who will clip coupons and scrimp on the pennies, but will then ignore the dollars and the savings on big ticket important items. Within reason, I could see this being one of those instances, where spending the $5 on a new binder today and ensuring that your child has all of the tools and supplies he or she needs — not just to attend school, but also to enjoy school — could pay off ten times over tomorrow when that child’s enthusiasm for school earns her a college scholarship. The correlation isn’t direct — no, a new backpack isn’t going to guarantee that Junior will get into Harvard for free — but it certainly can be the difference between a child looking forward to being back in the classroom and dreading it intensely. For me, the love of learning and education is an investment that I would happily break my budget to make, and if Harry Potter pencils are what make that a possibility, then Harry Potter pencils it is. We are pretty frugal for our BTS shopping already, but the school supply lists kill us. They never repeat from year to year, and they are always overkill because the teachers assume there’ll be some kids that don’t bring in stuff so they ask each parent to send in everything, rather than splitting up the requests. I’d rather give the teacher $20 and let the teacher purchase supplies when needed rather than have them get 24 boxes of markers that don’t all get used. And I’d rather the teacher hung onto the markers for the next year’s class rather than sending home a mix of slightly used ones that end up cluttering up our house, especially because the next grade is going to ask us for colored pencils or something else completely different and we already had our own set of markers on hand. I love how Donna understands that sometimes kids need a certain item just so they’ll fit in. Here’s my frugal tip along those lines – keep the Sponge Bob/Batman/Harry Potter stuff to items you know won’t make it to next year and may not even make it to the end of the school year – a folder for instance, is perfect for the fad stuff. Other stuff, like jackets and bookbags, are better off being solid colors. I may just be lucky with my kids, but with no attention being drawn to their blue or red jackets, backpacks, and pencil cases from year to year, they’ve never seemed to mind reusing items from grade to grade. I think that is a terrific idea. You could add an inexpensive novelty key ring to use as a zipper pull to update the backpack from year to year. Or get specialty accessories like Batman pencil cases which are probably a lot cheaper than the licensed backpacks. Back in the dark ages when I was in school, my mom and I would wait until after school had started. I would figure out which “in” item I wanted the most, and we’d get that, and fill in the rest with stuff that was kinda close. Mind you, this was the swingin’ sixties. We didn’t have sponges as cartoons. Just the Mod Squad. But they were hot….. I find the mocking tone of this weird – my experience with three-ring binders as a kid was that they lasted about ten minutes before the rings got bent out of shape and wouldn’t hold papers solidly. Using one for more than one school year would have been impossible. Also, frugality is good but there are few pleasures in life like being a young child opening up a brand new box of perfectly sharpened crayons. On a pleasure per dollar scale, I think that’s hard to beat. I’d use the old one for art projects (like the one where you crush them up and melt them into new shapes in the oven) and consider it money well spent. As I noted in the piece, there’s nothing like that new-crayon smell. As also noted, I’m not saying you shouldn’t spend money — I’m saying you should spend it intentionally. Donna’s a meanie-head who hates new crayons! -Just kidding. It’s kind-of weird, but even as an adult (without school kids) I always get the urge to buy new crayons this time of year. Fond memories of elementary school, I guess. I’m not sure that I saw this comment as at all mocking. In fact, it just seems indicative of Donna’s ability to inject a bit of humour into a dull topic. Office supply stores often have insanely cheap “deals”. Several years ago, we purchased a plastic drawer unit with wheels and decided that was “the place” for the school supplies. It holds anything related to schoolwork/homework/projects. No more running off to find the “report cover” needed at the last minute. I add to it when the “deals” are available, but our stock is limited to the drawers we have in the unit. Now I don’t re-buy colored pencils or notecards because I’m not aware they are tucked away in someone’s room. With the very cheap bundles of spiral notebooks and discounts on loose leaf paper, I’m pretty much only buying some binders (I have older kids now) when school starts. I try to keep writing tools, notebook dividers and various folders and report covers in there as well, purchased when I notice they are cheap. This system has worked far better for us than having all the items scattered around the house. We even sent the rolling unit off to college with my son, so he could use it for some storage in his dorm room. Don’t forget to grab some posterboard while you’re at it. The need for it always seems to come at the last minute. To store flat and out of the way, put it in a couple of strong magnetic clips and attach it to the side of your dryer or washer. Ours is behind the buffet in the dining room, with the cutting mats for quilting. Right – can’t forget the poster board! And mine is also tucked in behind the buffet. But I have to admit needing it and crossing fingers to see if there was still one sitting back there. Claudia is right, we stored ours behind the piano. so is my daughter….kids with elementary aged students think BTS is expensive?? Wait until they have to kit out a dorm room. okay, I have to drink more coffee…. I am so thankful my kids school has a bulk buying program. They purchase all school supplies to the exact specification they require and the parents pay a reasonable fee per child. Since my kids are relatively young, I’m still pretty new to this. As to the clothing thing, at least for my kids, a “new” set of clothes each year (whether purchased new or used) is non-optional – they grow too fast! Since the school year is also the beginning of cooler weather, it’s a reasonable time to do it. Thankfully my kids are the same gender and we’ve been able to pass down clothes to a reasonable extent. I am definitely looking forward to the day I don’t have to spend so much time dealing with outgrown clothing! I take advantage of the loss-leader items (I’m perfectly fine with buying only those items and nothing else), then the huge discounts once school starts, and I buy lots of those items that I know will roll over from year to year (pencils, folders, paper, etc). We have a plastic cart with drawers next to the computer and all extra supplies go in there. When I get the list in summer, first I check the cart. Now that my son’s going into high school (! ), it’s become rare to need to buy any standard school supplies now. Also, I work at a university that has a reuse list so when offices clean out supplies (binders, folders, etc.) or students clean out dorms, they post items available to take for free and I’ve gotten supplies that way. Plus vendor fairs provide me with more free pens than our family can use in a year. J’s charter school requires a uniform, and fortunately neither he nor they mind baggy one year and fits-but-snug-by-May the next. (That said, this is the year to drop $400 for more uniform pieces.) Outgrown uniform pieces are donated to the school nurse for kids who ruin their outfits through mishaps (unexpected periods, stomach flu, etc. ), plus I think the school quietly gives donations to families struggling with finances. My kids wear uniforms too. We actually have a uniform closet in the school where parents can take what they need and leave what no longer fits. It’s great for families who are struggling and really it requires very little maintenance to keep it going – it’s just getting the school to give up the closet space. About twice a year the school asks for a volunteer to go straighten out the uniform closet and resort the clothes by size order. I hope other parents whose kids wear uniforms suggest this idea at their schools. What a kind gesture. What a great post! I just posted on FB to have people send me a full list of what’s needed for back to school. These helps everyone. It helps me for getting ready to have kids that will someday need me to shop for stuff and 2 it helps them see how cheaply I can get it. My goal is to take a few lists (if I can get them) and go out and buy stuff. Yes, I’m late to the game as the office supply stores already started their back to school sales but I will still try. I aim to get 2-5 lists of different age groups (pre k to high school) and go from there. I can either donate all the stuff or maybe pick the people that sent me the list and give it to them…we will see! Not the most frugal approach but for a few years my kids and I would collect all the school supplies, check out the list, go out and price everything…if they could use it from our collected supplies and did, we split the difference between what I would have spent buying all new and what I actually spent. My kids like easy money so they really thought through what they thought they “needed.” All of a sudden backpacks were just fine, and slightly used markers, highlighters, notebooks, etc were good enough too. I have to say, I did succumb to the $5 backpacks one year at Office Depot: it was great to have one ready mid-year when a bully ripped up one of the kid’s packs. Our state has a “tax-free weekend” for clothing every summer during which any clothes/shoes under $100.00 (so, athletic shoes but not the most expensive models) are tax-free. This can make a difference. When I was a child, my mother let us get only one new outfit in September. All of August I’d agonize over the Sears catalog choosing what dress I’d choose. For those of us who don’t have kids, it’s also a good time of year to stock up on office supplies ;) It’s been a few years now since I was a grad student or a teacher, but I never got out of the habit of going through all my old supplies to see what works/what doesn’t any filling in any gaps. And as a former teacher, parents: don’t let your kids have everything all at once! You wouldn’t believe the stuff that’s treated carelessly when kids know there’s always more in the package or more at home. My older son is starting college with the Eddie Bauer backpack I bought him in third grade. I even bought it on clearance way back then, paying about $15 for it. Right around the start of school is a great time to thrift for kids clothes – lots of parents buy new clothes and donate outgrown ones to the charity stores. Donna, thanks for the trip down memory lane – I remember those dinosaurs! I hate school! No more reading whatever you want, no more going to the beach, and all that endless math homework… DEPRESSING. The key is figuring out what to buy cheap (folders for 1 cent each? Super steal! ), what to invest in, and what not to buy at all. I have a backpack that I used all through high school and college, and I bought it on sale too! As we wrote about on our blog (http://tinyurl.com/3ze7zre), it’s important to know when to shop and then buy only what you need. The store always suggested I purchase things I didn’t need, so it’s probably a better idea to not let the kids see them (otherwise they may convince you they that they “have to have” it because the list says so, and everyone else will have one! But in the end, they won’t use it). Make your own thoughtful list with your child! You could maybe create a sort of “savings and rewards” plan, where if you can come under budget or buy as few things as possible, you can put that money towards something they need (for older students, a laptop for when they go to college; for younger kids a more age appropriate tool). It’s a great way to combine learning about the value of saving and being conscientious about back to school shopping at the same time! I can’t believe that kids have to take in supplies for the whole class or the teacher in the states. In the UK most things are provided at primary level (notebooks, pencils) then you just need your own pencil case, pens, calculator etc in secondary – but you’d never have red pens, or white board markers or boxes of tissues – that’s ridiculous! I bet that within the next 5 years, all textbooks will be converted to some kind of Kindle device that we will be required to purchase. Which actually might be a good thing if they don’t make you upgrade it every year. In our school corporation (Northeast Indiana) last year they started a program where K-2 use iPod touches,3-5 use iPads, and 6-12 use laptops. We have to pay a maintenance fee for renting these throughout the school year on top of book rental fees. If any of these get stolen, we’re required to pay for them to be replaced. In the younger grades K-5, they keep the iPod touches and iPads at school, but grades 6-12 have to carry their laptops back and forth to school everyday along with everything in their backpack. My problem with this program is that not everyone can afford to have internet in their home or drive their child somewhere everyday that has internet so they can get their homework done. Our school had back to school kits that you could buy for $20 that had all the required school supplies for your particular classroom. I checked to see if I could get that same stuff cheaper by shopping around, but the savings was so little that I decided not to fuss with it and just purchased the kit. School supply shopping done! I’d like to point out that even for those of us who don’t have kids, now is the perfect time to shop for office supplies. Last year, I got four packs of index cards (the kind I like to write down daily expenses on) for 1 cent, a backpack for work for $9 at Borders (may it RIP), two college rule notebooks for a dollar, and so on. Oh, and a new desktop PC for afterhours webdev work…. One of my fav times of the year…! I’m in Canada but I’m fortunate enough to live in a school district that does not send home supply lists. All my son has to take to school is his backpack and lunchbox (re-using from last year). For any other supplies he needs (for home) we go to the dollar store. We can find almost anything there for $1! I hear so many parents complaining about the price of uniforms these days. They have every right too! If you want to buy a uniform that lasts at least the whole school year the more expensive are the better choice. One parent, who is also a school teacher, told me over the weekend that another friend of hers gave her all of her daughters school uniforms becuase she’s starting to outgrow them. This is a great idea for those parents who have trouble finding the extra money for uniforms: find someone with a girl or boy about the age of your child and see if you can use their old uniforms they have outgrown. Also, techsupported, you have a great idea shopping for office supplies during back to school sales…whether you have children or not it’s a great way to save! I’m surprised no one has mentioned this yet, Garage Sales! I’m pretty sure growing up about 1/3 of my yearly school supplies (folders, binders, crayons, markers) came from garage sales. I actually liked it, got some interesting name brand or colorful items from this, otherwise it was the cheapest solid color items we could get. Backpacks were supposed to last several years (though usually fell apart), one pair of payless shoes a year, and a lunch bag like you can get at a grocery store, solid color and cheap. I don’t remember being an outcast for my non-name brand items, but then at the time it was a lower income sort of area. I’m sympathetic to parents now and the drastic cuts that have made all these “required lists” required. Nowadays parents are also responsible for checking their childrens homework etc, I can’t even imagine! Garage sales were in fact mentioned in the piece. You find a whole lot gold among the dross. I decided to buy a “box of school supplies” through my DD’s elementary school. Even if it doesn’t save me any money, it saves me time in that I don’t have to go to multiple stores in an attempt to get all the loss leaders. Although I had to buy extra glue sticks several times (kindergarten), various extra supplies did came home with my DD at the end of the school year. As a middle school teacher, we decided this year to bring the students out to the hallway and empty lockers one by one. It was sickening how much stuff (a lot brand new) they had in their lockers that they would throw away if we weren’t watching. Remind your kids at the end of the year that you’ll be expecting them to bring home the items they don’t use. Quite a few of ours refused to take it, so we have a good stash this year for kids who can’t afford to buy the supplies. Another thing we did as a grade level was to really cut our list down to bare bones this year. I figure if my students need another composition book by the middle of the year, it means they’re writing a lot, and I’ll be happy to spring for a new one for them. CLOTHES: I have 2 boys, age 14 and 11 and got them 3 tops, 2 pants and sneakers per kid. I found leather sneakers for my kids in MENS 14 and 11.5 on Amazon for $47 and with free shipping! I also buy required uniforms with coupon codes. Our school does take in used uniforms and then sells them at a garage sale in the Summer. It’s a way for the school to make $ and for parents to buy uniforms cheaper. I have spent $400 on clothes. LUNCH BAGS: I have gotten them for $3 on clearance in the past. They are fabric and insulated and use velcro closures. My cost is free this year. WATER BOTTLES: Got them at the dollar store. I spent $2. BACKPACKS: We reused one and I bought another on sale for $40. In COLORADO, public schools have now CHARGED for riding the BUS! Yup. $1 round-trip per child. No discounts on big families. We have taken the private school route the last 2 years and carpool whenever possible. We also RENT books here and each grade has a different fee. I’ve spent $30 in rent. I think the department of education is in collusion with the retail industry to try to extract as much money from parents as possible every year. So the schools create these ultra long back to school list but the items never get used by the kids during the school year. What happens to that box of tissues from last year that my kid never used? My colleagues toss out piles of folders unclaimed by students. One of my students (mom of 4) and I used to retrieve the folders and recycle–she to her kids, I to my children and my students. Supplies are not as cheap as they were during the housing bubble. Still, you should buy enough for the full year, because the deals don’t roll around in January. As a previous homeschooling mom, back to school shopping seems stressless compared to the first years of deciding on books to buy as well as everything else. I did an inventory of all the stuff that came home with them last year before I bought. I spent $31 on the things I didn’t already have, not bad, considering half of it will likely come home again at the end of the year. My kids attend public school, and there is a dress code but not uniforms. I am sending them in uniforms anyway. I spent $300 to completely outfit my 2 kids for the year and everything matches with everything else which leads to no fuss for outfit selection. I wish I knew of some local schools that have used uniform sales but I have yet to find one. I picked up some of the uniform things at thrift shops but the Old Navy $5 polos are hard to beat, even compared to thrift shops. My favorite frugal “school supply” purchase was the two LL Bean backpacks I bought for the kids as a Christmas 2008 gift/wrapping (we were moving in early January, so put travel games, snacks, etc. ), on a closeout sale. I can’t remember how much I paid for sure, but I know it was dirt cheap, compared to their regular prices (which, in my opinion, aren’t too bad to begin with). It pains my daughter that she doesn’t get a new backpack every year with the t.v. character of the month on it, but those backpacks will probably last until they graduate college. Two and a half years, and other than a little dinginess, they look brand new. I would definitely recommend LL Bean bookpacks, even at full price. I really liked this article. The author did a great job! I don’t even have kids, but I still get caught up in the back to school hype! I had to talk myself out of getting a dry erase board the other day at Target. For the record, Dixon Ticonderoga #2 pencils are the absolute best! My kids used to get $100 each to spend on new clothes for high school each year. They could be thrifty with it and get plenty of on sale items or splurge on just a few things. It was up to them. As a child I loved the feeling of new notebooks for the new school year. If the big lists is because you are buying for those who do not buy…..be one of those who do not buy too! No….I would not do that to my child…..but I think to send him off with one of everything and forget all the extras for others is fine if you are hurting financially. As a result of federal and state budget cuts, schools are no longer able to provide the classroom supplies needed for teachers to teach. (e.g. How could a teacher demonstrate solving math problems on a whiteboard without whiteboard markers?) Items that you think your child may not use ARE used by the teacher to instruct and keep the classroom running. For example, I regularly buy two extra sets of notebooks (not to mention the other materials required to start the school year) for each of my students to support those that can’t afford to buy school supplies and for extras when new students arrive in the middle of the year without their supplies. Whatever is not purchased on the list, teachers pay for out of their own pocket. On average, teachers already spend hundreds a month in their classroom (even with you sending in these supplies) to make your child’s time at school more fun (like more books to choose from in the classroom library). Given that many teachers are experiencing pay cuts (or benefit cuts which just transfer that financial cost back to the teacher) on top of already low salaries, please be considerate to those who dedicate 50+ (I average 60 or more) hours per week teaching, coaching, mentoring, facilitating, encouraging, and challenging your child. P.S. And those red pens? It’s a way to make editing their work more fun! Kids love when they get to use the “teacher pen” to mark up their own work. In my mind (and I’m pretty sure anyone who has ever taught the dry task of editing to a group of elementary school students), a pack of pens is such a small expense to gain enthusiasm for and experience in editing. P.P.S. Pencils and pens disappear regularly – often to homes to do homework with! So sending in extras just prepares the classroom for the inevitable losses of the year. I was also unsure why the supply lists seemed so extensive. But when I volunteered in the classroom, I saw a different perspective. Now I know why classrooms need so many tissues, disinfectant wipes, hand sanitizer, ziplock bags etc. Yeah. even if your kid never has a runny nose, don’t you want the kid *with* a runny nose to have a tissue instead of wiping it on his hand and touching stuff your kid will touch? I’d like to add that outfitting a college freshman girl with dorm decorating was a killer for me a few years ago. I now know that by the 2nd weekend in September Target will have everything for dorm rooms at 50% off or more! Ugh! What a money trap for freshman parents. DOLLAR STORE!! Amazing what you find there. I remember when my son was in high school and he cared a lot about wearing brand-name clothes and wanting to fit in. We worked together to make it work while not spending too much money. First, he’d try on all of his clothes and we’d take inventory of what was needed. He didn’t care about the brand of shorts or jeans he wore, so we purchased a few of those at inexpensive stores. I found that the best place to buy name brand shirts were stores like Ross, TJ Maxx, and Marshalls. The shirts were 9.99 there, compared to 25.00 at the mall. I would buy one name-brand hoodie there also. Grandma pitched in by buying him one pair of rather expensive “cool” shoes that had to last him all year. With a few hand-me-down clothes and thrift store clothes thrown into the mix, we really didn’t spend too much money, and my son was happy. My school’s actually was. And by my school, I mean art school. I started my first year of university studying ceramic design with a must have list of 3 pages. -a macbook pro. Yes, they wanted us to buy a macbook pro, for no discernible reason. Apple products do not make you instantly arty, but the way people act at my school, you’d think they did. I bought a Sony Vaio for a 3rd of the price. -Full Adobe CS5 suite. I don’t need dreamweaver or illustrator for my course at all. We used Photoshop for various things, but I downloaded GIMP for free and managed to do everything my classmates did. -the little footnote saying “you may need buckets and bowls”. First day, first session we were asked where our buckets for mixing plaster were because we were going straight into mould making. Well, oddly enough, there aren’t any cheapo shops in Holborn, so we had to go to the local premium hardware store and fork out Â£7 each for a freaking bucket. As for real school, I went around from the age of 13 with a backpack with the Biomedical Science Congress logo on it that my mum had been given for free at a medical convention. One year I challenged myself not to buy any pens and just use ones I found- and managed for the whole year up until my exams. Parents, your pens are ending up on the floor! My mother is saying that a private school where she lives had i-pads on the supply list for every student. I see this as the future….the schools will not longer have to buy computers for the school …..just passing that bit of the budget on to us just like we are already buying scissors, glue etc that used to be the schools job to buy. Wow, shows what a hold these shopping impulses have on me. I’ve been out of school for a while now. Obviously, school supply shopping is my ‘thing’. Yep..the whole backpack thing? I’m being played by my kid. I did figure out though…just get a plain color lunchbox instead of the “barbie” and it lasts way longer (no fad involved). I am learning slowly but surely. Used clothing at consignment shops often cost more than the clearance racks at the store. Took me a few years – but I get smarter every back-to-school season! The sports clothes are the killer. These kids think they need $200 tennis shoes to play better! Get to work, kid!! I feel like I should be thumping my cane when I say this, but in my day schools stocked a lot of this themselves. E.g. tissues, crayons, glue, scissors, rulers were already there and our parents didn’t have to buy them for us to participate in government mandated primary education. My friends mother worked as a school custodian and got many of her kids (she had 8 of them!) school supplies from what the students at her school would throw away. On the last day of school, when the kids were cleaning out their lockers, apparently they would throw away all sorts of great stuff – some not even used. My friends family had a whole closet full of these cast-offs! Now that my friend is all grown up and works for a school herself (as a teacher), she collects some of the year end cast offs for her students to use the next year.